Kobe Station, c. 1920, where the Tokaido Main Line from Tokyo ended and the San’yo Main Line to Shimonoseki began. The track section between Kobe and Akashi (12 mi/19 km) was electrified in 1934 but the complete electrification along the entire length of the San’yo Main Line (333 mi/537 km) to Shimonoseki was not realized until 1964. “Kobe marked the end of the IJGR [Imperial Japanese Government Railway] Tokaido Line and was the start of the San’yo Tetsudo. 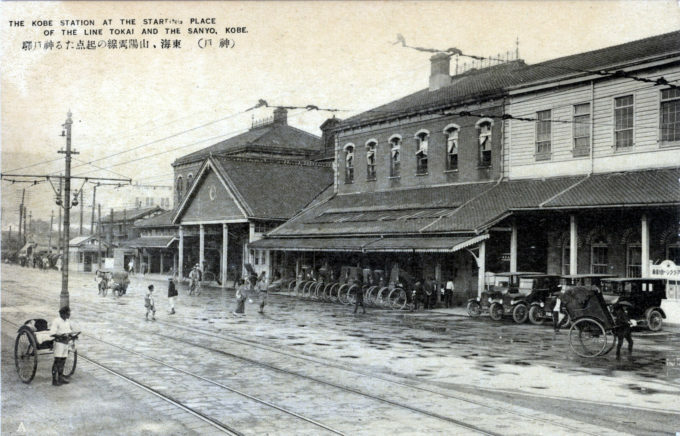 During the building of the Kobe-Kyoto line, Kobe served as the national headquarters of the Railway Bureau. 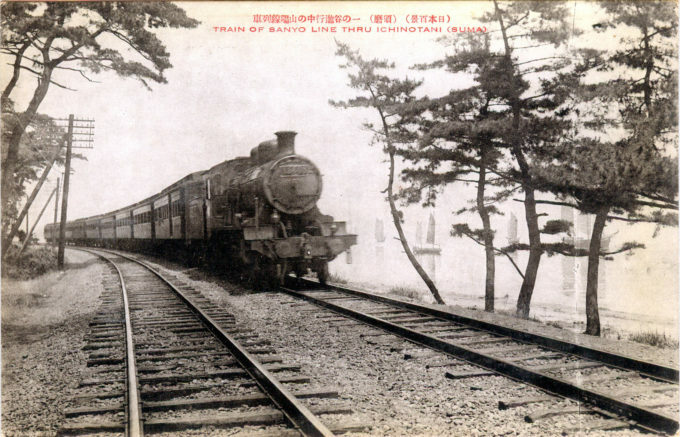 “… In 1888, a charter was granted for a railway to run a trunk line southwesterly from Kobe, where it had been granted running powers over the approach to the IJGR station, to the port of Shimonoseki at the very southern tip of Honshu. “Train of San’yo Line [sic] thru Inchinotani (Suma)”, c. 1930, with an 8620-class steam locomotive pulling the express carriages along the Suma coast just west of Kobe.